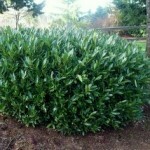 A compact shrub with glossy, dark green foliage and white blooms in spring. Makes an excellent low hedge or in mass plantings. It may be pruned after flowering to maintain the desired size. It prefers full sun to part shade, in a moist, well-drained soil. 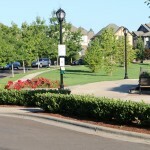 Once established, it tolerates drought, poor soils, and dry shade.